Simply add your plan as a file to your project and list it as a planning source and as a result the database will be automatically populated with the plans data each time a new version is checked in. Uniquely this system works with Microsoft Project (.mpp) files, Planner (.spn) files and plans built using our free excel template. So supporting your large and small projects alike as well as providing you with an amazing level of capability without needing to purchase Microsoft Project. Of course if you want to use MS Project, simply load your .mpp file to your project and it will be visible to work on also to report on and share with team members. Of course if you create your project from our standard methods your plan is all set up just start adding tasks. You can even convert your MS Project files into our free Planner format if you want. With this simple pattern the system builds your data store of all current plan and task data for you. So users can then see their resource profile and a list of allocated tasks, direct from the database. Without any need to go find the plan or have a tool like MS Project to open it. You can also set up notification rules and then get email reminders, helping keep you in touch with the project. Project Managers can even set up dependencies which apply between different projects. You will find this great when setting up your programmes. …and also many more, you decide. Your choice of data range and the view control the analysis output produced. The combination of filters and display options is referred to as a ‘View’. Helpfully we provide you with a preset package of useful views. You can also customise them or create your own and save them for reuse in analysis and in reporting. So what can you do with your planning data? As well as the ever popular Gantt and task list displays you can also produce Resource profiles and resource tables – providing a merged picture of the work allocated on all the tasks in the data range, grouped by person. Task names are provided for you on hover providing you with great interactivity. You can also change aspects of the analysis including period (days, weeks, months, years) or the individuals or groups you want to display data for. You can also display your plan/task information as milestone timelines and calendar views as well as export .ico files to load into your other calendar applications like Outlook. With all analysis once you have the view you want it is easy to export or print. Of course you can also include these nicely formatted outputs automatically into your project and portfolio reports at the touch of a button. Data held on the tasks can also be accessed by the Notifications engine allowing rules to be set and the system will then check all rules against all tasks at a frequency and email you to advise when the conditions that interest you are met. For example telling people about tasks due to start or which should have finished but not shown as complete. This is great saving the PM one of those mundane chores. Ready to find out more about planning? We have prepared two videos to help you find out more. First of all this overview, slides and discussion of the planning capability. If you don’t use YouTube you can also view it here on our website. And if you want the same intro then the full demonstration of that planning capability this explored video is perfect for you. Again if you don’t want to use YouTube you can see it on our site here. 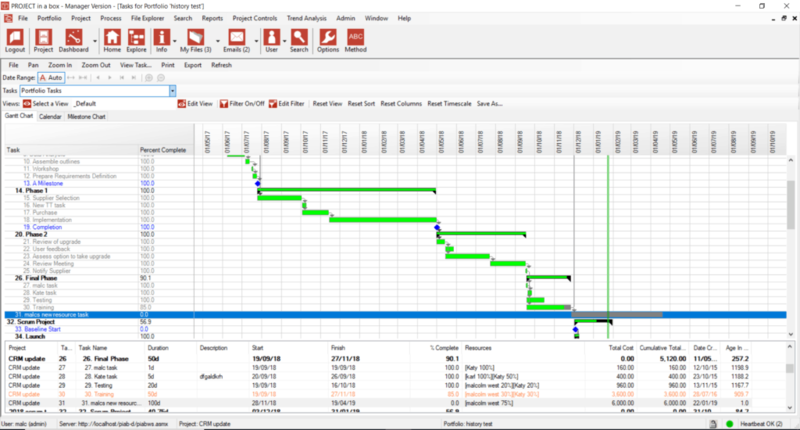 Personal Edition – Basic plan and Gantt display into reports, no resource management capability or interproject dependencies. Small Team, Enterprise and Live Edition – Full Planning and Resourcing as described. Providing a team with a valuable capability at a fraction of the price of the alternatives.